There’s racing hard from the gun—and then there’s a courageous assault on your limits, where you knowingly put yourself out there in every sense of the word and make a statement about yourself as a contender.The latter is the type of racing 24-year-old American Olympian Ben Kanute brought to the table on September 10 when he finished second at the 2017 IRONMAN 70.3 World Championship in Chattanooga. Kanute—still new to long-distance racing—is no stranger to good results on tough courses. He won the 2017 Escape From Alcatraz, and placed fifth in a stacked field at this year’s IRONMAN 70.3 St. George (a race won by two-time Olympic gold medallist Alistair Brownlee in his 70.3 debut). 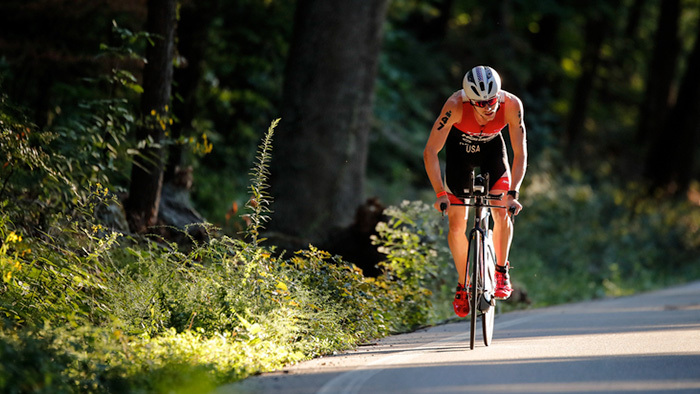 Both races are known for their unrelenting bike and run courses, but, as Kanute told us a few days before Chattanooga, he has enjoyed his foray in long-course racing, and has embraced the changes in training post-Rio. This year’s IRONMAN 70.3 World Championship course didn’t pull any punches. The swim was non-wetsuit (for the pros) and largely upcurrent, the bike featured an 8.5-mile-long, 8-percent grade climb in addition to 3,000 feet of elevation gain over 56 miles, and the two-loop run was full of tiny rollers throughout that knocked the sails out of the pros and age groupers alike. To learn more about these metrics and how they can help you improve your performance, click here. Kanute led the swim, exiting the water in 24:03, five seconds in front of eventual champion and fellow Olympian Javier Gomez, before quickly establishing a lead out front on the bike as he jetted toward the climb up Lookout Mountain, which started a mere 10 kilometers into the course. “I wanted to cap myself at 400 watts up the climb,” says Kanute. “I had done intervals up Lookout in the days before the race where I played with intensity, and I felt my legs really felt good as I started the climb, so I just held right up at the edge of my zone and told myself I would evaluate things again once I got to the top.” Indeed, looking at Kanute’s file, it indicates that along that climb he averaged 385 watts for the 8.5-mile ascent. Despite the fact that several IRONMAN and IRONMAN 70.3 world champions were attempting to hunt him down on two wheels, when Kanute made the crest of the hill he looked around and saw that he was all alone. “Knowing I was still in front gave me the incentive to just keep pushing, and so I did,” he explains. With a four-minute cushion between Kanute and IRONMAN and IRONMAN 70.3 world champion Sebastian Kienle (among others), the American would need to pull out one heck of a half-marathon split to take the title. While Kanute admits his legs were heavy coming out of T2, he still felt he found his stride earlier than expected. However, to those watching, it was apparent that Gomez—who exited the bike just a short distance behind Kienle—was keen to run down the lead and nab his second IRONMAN 70.3 world title.